Epson L200 is an All-In-One printer, All-In-One printer is a printer unit has multiple function as Scanning, Photocopying, and printing. Epson L200 comes with 6 ink bottle consist of 3 Black Ink, and colored ink, 1 bottle for Cyan, 1 bottle for Magenta, and 1 bottle for Yellow Colors. This set of inks can yield approximately 18,000 pages for black and 6,500 pages of colored print. Epson L200 adopt the technology of using an ink tank or before a converted printer done by the third party. Epson L200 comes with many advantage and on the other hand, also we expect some worst problem arising from it. The common problem with this printer are the following; no power, printing problem, ink pumping, and blotted image. 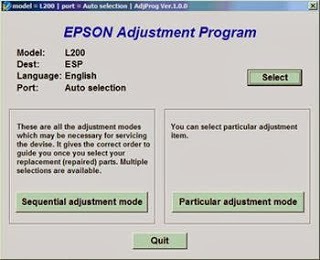 Run the Adjustment Program for Epson L200 , choose Particular adjustment mode . Turn the printer off , then turn it on again and wait a few moments . To check whether the counter value has been successfully reset , press the Check button , Main pad counter value should be changed to 0 % . Click Finish to exit . Thanks for sharing this post its really useful for people like me who are planning to reset there printers. Epson has expensive range of multifunction printer. With Epson printer Home & Office inkjet, scanning and copy features. Canon Printer is best for its services and support of their customer service. It is necessary to get a compatible printer drive for your Epson Printer otherwise you will face different sorts of issue while printing from Epson Printer. You can download and install the latest and most compatible printer driver from Epson official website or get access to Epson Printer Driver Support through our toll free helpline. In fact, you can download the driver through the CD/DVD that came along with your printer.